"We need a feminist constitution"
How is anyone going to go to work if no-one does the ironing, cooks, or looks after the children? I think putting this issue on the table is one of the great victories of March 8. An interview. Barcelona March 8 feminists on strike. 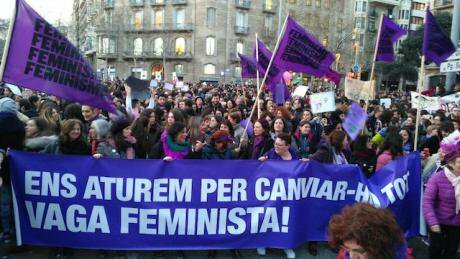 Banner slogan: "Ens aturem per canviar – ho tot: vaga feminista!" “Feminist strike: we strike to change everything.’ All rights reserved.Laura Pérez welcomes us to her office at Barcelona City Hall, which is still covered with posters from the feminist strike of March 8. 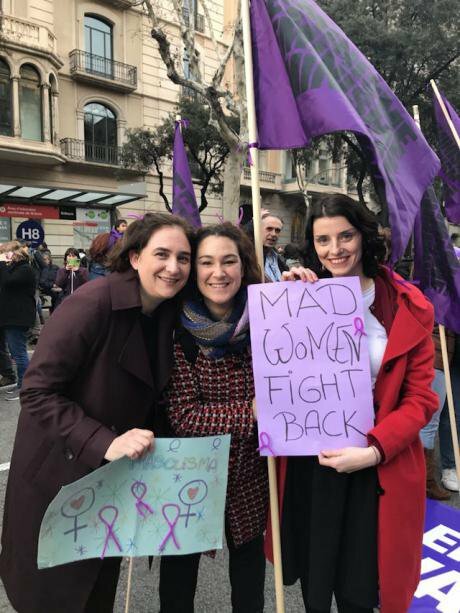 On that day, the councillor didn’t go to work; she joined the 24 hour strike called by the feminist movement marching on the streets of the Catalan capital alongside mayor Ada Colau. We were talking to Laura Pérez about the rise of feminism in Spain and her assessment after more than two years at the helm of the Department of Feminisms and LGBTI. Pablo Castaño (PC): How do you understand the sugnificance of Thursday’s feminist strike and demonstrations? Laura Pérez (LP): It was a magical day for all of us who’ve been involved in the transformative process that is the feminist movement here in Spain; a moment of collective expression after months of work. It’s been a turning point, a collective cry of “enough is enough”. Enough of inequalities, of our issues being minimized, of being left off the agenda. And I think what’s been achieved is that the political agenda can’t keep looking the other way. Rajoy will no longer be able to say that this can’t be talked about, that he won’t get involved. PC: What about the role that the unions played? LP: It was inadequate, particularly on the part of the biggest unions (CCOO and UGY called a two hour strike while CGT and CNT called a 24-hour strike, as the feminist movement had requested). It’s obvious that feminism isn’t a priority for the biggest unions. Some of the greatest workplace inequalities are those faced by women working in the care sector, domestic workers. They are subjected to many abuses which wouldn’t be the case if they were men. If the sector was dominated by men, this wouldn’t be the situation. Some of the greatest workplace inequalities are those faced by domestic workers. They are subjected to many abuses which wouldn’t be the case if they were men. And this is a struggle that’s being led by migrant women who have organized in cooperatives and alternative unions, and who are working to raise awareness about this situation. But I think it’s not a priority for the main unions. A two hour strike wasn’t enough, and we also witnessed some male union leaders seeking the spotlight in an inappropriate way. They didn’t seem to understand that their role was to take a step back on that day. They should have been more active in the daily struggles that fill the squares defending the rights of women in the Catalan collective labour agreements for cleaners, textile workers and many other sectors. PC: After the success of March 8, what can the feminist movement do to translate this energy into public policies for women? LP: I think the movement has already done a lot. This issue is now on the agenda, and if there’s been legal progress until now it’s thanks to many women who came before us who, in even more difficult circumstances than today, fought for our rights and for legal equality, for the law against gender violence, among many other issues. I think we’re in a different moment now, perhaps even a new wave of feminism. First you achieve political, civil, sexual and reproductive rights. And now I think we’re in a time in which many women who have broken the glass ceiling and entered into spheres of power are seeing the limits that still exist. As the movement reflects on this current stage the sense is that it needs to keep going, to be consistent. We’ve achieved this turning point, we’ve filled the streets, the media is talking about it. Now it’s time to make our demands. We’re here, we’re not invisible, and we’re not just another sector of the population: we’re 50%. We’ve got to stick together and keep on defending important issues like workers rights, a national budget to tackle gender violence and so many others. We’re here, we’re not invisible, and we’re not just another sector of the population: we’re 50%. PC: Many women from the feminist movement are now in parties and institutional politics. This is a process that has taken place historically, and in other countries as well, and it usually produces tension. What role should political parties play in this new stage of feminism? LP: I feel part of what’s happening, somehow, though obviously I’m not in a leadership role, because I don’t think there are any in this case. Feminism isn’t based on the creation of leaders who the masses follow, but on a collective process, always open to question. But I do think we’ve played a role because public institutions offer a new site of action that goes beyond what you can do as a movement. A lot has been said about tension but I haven’t experienced this in Barcelona. Yes, I’ve had to take on a new role that is sometimes uncomfortable, because it doesn’t allow the same freedom you have in the movement. But it also provides opportunities to add to the work of the movement. Those of us who come from the feminist movement know how it works and we respect it; we don’t want to lead it. But we can use feminist public policy as a tool to collaborate in this process of change. 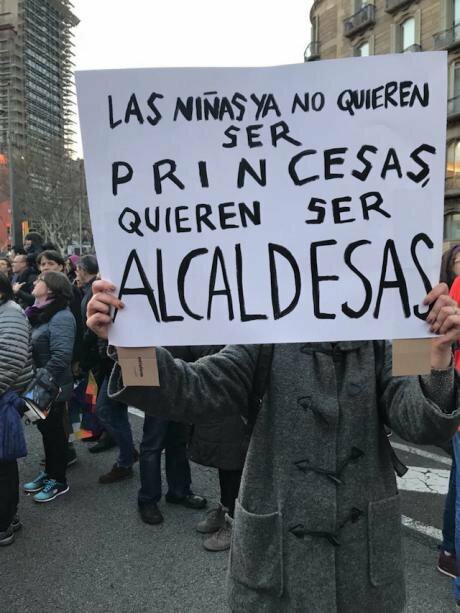 "Las ninas no quieren ser princesas, quieren ser alcaldesas." “Girls no longer want to be princesses: they want to be mayors.” All rights reserved. PC: What has been the significance of care work in this strike? LP: The issue of care work has been at the centre of the strike. What makes this strike different is that we’re saying that we’re going to stop the world turning because we’re taking on the majority of reproductive work, which is usually unpaid. And the data is there: women dedicate more than twice as much time to care work as men. And this requires us to question the system. It’s a critique of a system of production that invisibilizes half of the population. How is anyone going to go to work if no-one does the ironing, cooks, or looks after the children? I think putting this issue on the table is one of the great victories of March 8. Starting this summer, Barcelona will have a service dedicated to care work. When you, or a relative, are diagnosed with an illness, or you get old, or you have a newborn, you need care, and that means you need information. If your mother is diagnosed with Alzheimer you’re going to have to renovate your home, find a care centre, someone to help. What working conditions will that carer have? Care is something so everyday, but we’ve made it invisible so it’s really difficult to create public policy that people can understand. Care is something so everyday, but we’ve made it invisible so it’s really difficult to create public policy that people can understand. PC: What are the most important feminist policies implemented by the City of Barcelona since 2015? LP: There are too many to mention, but what’s most noticeable is the effect on city staff of our gender mainstreaming policy. We’ve set up a mainstreaming department that works with all city departments. Whenever there’s a new plan relating to youth, education, work, culture… it includes this perspective. We’ve also revised our procurement policy to include a gender perspective and included a gender focus in the city budget. It’s the feminist transformation of the institution. I like to think that we’re inoculating feminism across city hall, to the point where the city planners now call us with questions about their projects, to check that they’re taking gender into account. Or they’re going to put up a billboard and they check whether the advert on it is sexist or not. At first there was resistance but now there’s active collaboration. PC: Would you say that the local level is the best for implementing effective feminist policies? LP: I think it’s the most necessary level because it’s the closest level of government to the people. I know almost all of the feminist movements in the city, or the work that they do, and that’s enriching for my work. And the fact that they know the institution is behind them helps them to form networks at national level. The impact of the “Anti-Sexist Barcelona” campaign by city hall is so concrete…. you see it in the local festivals, the nightclubs on the waterfront, the Sónar and Cruïlla music festivals. It can communicate more directly and fluidly because it’s a local campaign. But the national level is also necessary, because the municipal level has its limits in terms of the laws you can pass. For example, in relation to human trafficking and sexual exploitation. I take on these cases, and we’ve created a unit to assist people who’ve been trafficked. This unit, the only one of its kind in Spain, coordinates the public prosecutor, the judiciary the police, social services…. We set it up and we detect the cases but when they reach the courts we don’t have the tools to protect victims, and this makes them extremely vulnerable. We need a law that protects victims. We’ve pushed our local competencies to the limit, and no-one’s done more than Barcelona to deal with trafficking, but we have to call on other levels of government to take it as seriously as us because the situation is really dramatic. Sexist violence is another issue. We’ve invested 5.5. million euros a year, a million and a half in housing, we’ve created specific work programmes for victims, we’ve municipalized the sexist violence services to improve the conditions for workers. We’re investing more and more resources. But will we be able to end sexist violence from Barcelona City Hall? We need a national government that takes it seriously. It’s an issue for the whole of society, not just one city hall. But will we be able to end sexist violence from Barcelona City Hall? We need a national government that takes it seriously. PC: Do you think that Barcelona’s feminist policies will last? Would they survive a change of government? LP: I’m very satisfied with what we’ve done but you can’t change everything in four years. There weren’t any feminist policies in the city hall before. For example, the impact of the inclusion of a gender perspective in urban planning, which has been used successfully in Vienna for years, won’t be felt by city residents for a few more years. Our policies on the care economy or measures to combat the feminization of poverty or to improve women’s health are long-term policies. On March 8 I was with Ada Colau all day on strike and people were saying to us “you need four more years”. We’re creating long-term policies so we’ll need time to change things. I also think it’s important that we know that civil society is by our side. One of my main concerns is to really bed down policies so that they can’t be changed. And that will be possible thanks to the support of civil society. For example, the training of city staff, gender mainstreaming policies, and policies with a gender perspective won’t be easy to dismantle because people have taken them on as their own. On March 8 I was with Ada Colau all day on strike and people were saying to us “you need four more years”. We had to start from scratch with housing, feminisms… Now there are areas where we’re doing what the movement asked for. By contrast, I get the impression that the Popular Party government in Madrid is being left behind, the movement is way ahead of the current government. In Barcelona I feel like we’re side-by-side, moving forward and providing solutions. If only we had someone in the Spanish government who would respond and propose a feminist constitution, which is what we should demand right now. We want a legal framework to meet our demands. That means, not just a cross-party national plan to tackle gender violence, but also funding and a new law against sexual violence. It means a constitution that takes women’s perspectives into account, that has women, who were excluded from the drafting of the current constitution, participate in its design. At the moment, civil society is far ahead of anything that this government is offering. March 8, Barcelona: Ada Colau, Laura Pérez and María del Mar García Puig (MP in the Spanish Congress for En Comú Podem). All rights reserved. This interview was originally published in Spanish in Público on March 10, 2018.